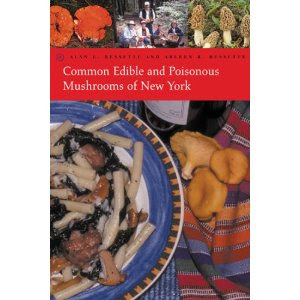 A native of upstate NY, avid outdoorswoman and hopeful homesteader, I was excited to see this book being offered by Syracuse University Press, because as of now, the only mushroom I've felt safe gathering and cooking for my family has been giant puffballs. I'm pretty sure I've been mowing over a splendid edible variety every summer and am looking forward to using this book to see if I'm correct. I really like the spore and bruise tests given for each mushroom so I can make sure I know what I am gathering and whether they are edible. I know there are many more mushrooms than this book covers growing out in the beautiful wild about me but I think this is a fabulous place to begin learning. My only dislike of the book is a superficial one, the photographer in me cannot tolerate flash photography and the photos would have been so much more welcoming and appetizing with a natural light source. If you are a New Yorker, I'd pick up a copy - what a great book! Looks like a great resource. We just moved states this summer, to a new area where none of the plants are familiar - time to buy some guides! Please do be careful with the mushroom picking! Our neighbor's sister, a mushroom hunter with many decades experience, ended up in a coma after misidentifying one and eating it. It sounds like your guide gives excellent clear advice though.